The following new capabilities are now available in Azure DevTest Labs. Apply artifacts to an existing lab VM Artifacts in DevTest Labs allow you to apply predefined configurations or install applications in order to save you time from VM provisioning. It's highly integrated when you create a VM in the lab (for more information, see Add a VM with artifacts to an Azure DevTest Lab). Now you can apply artifacts after a lab VM is created and running. For any running VMs in the lab, simply click the context menu for the VM where you want to apply artifacts, and follow the same flow to choose and apply any artifacts you want to the selected VM. Add additional artifact repositories You can add multiple artifact repositories in a single lab so that you get more flexibility to manage artifact files in different repositories and branches for different purposes. Disable an artifact repository If you want to temporarily remove an artifact repository from the lab (for example, to fix bugs), you can disable it from the lab. The artifacts in the repository will be hidden from your lab users, and you don't need to add it again by filling in the properties when the repository is ready. To disable an artifact, in the artifact repository settings, select Disable from the context menu of the selected repository. Specify branch information when setting an artifact's source control repository When you set up a private artifact repository in DevTest Labs (in addition to the GIT clone URL), you can also specify which branch you want to connect to. This means that you can connect to a testing branch in a lab for artifact testing without affecting other lab users who are using the artifacts from the master branch. 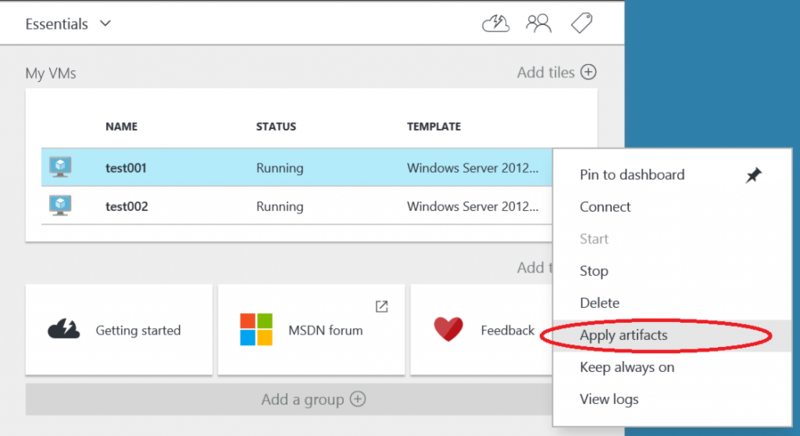 Create a template from an existing VM by using an Azure Resource Manager template You can take a snapshot of an existing VM in DevTest Labs for further testing by using a Resource Manager template. As an example, check out this quick-start template. 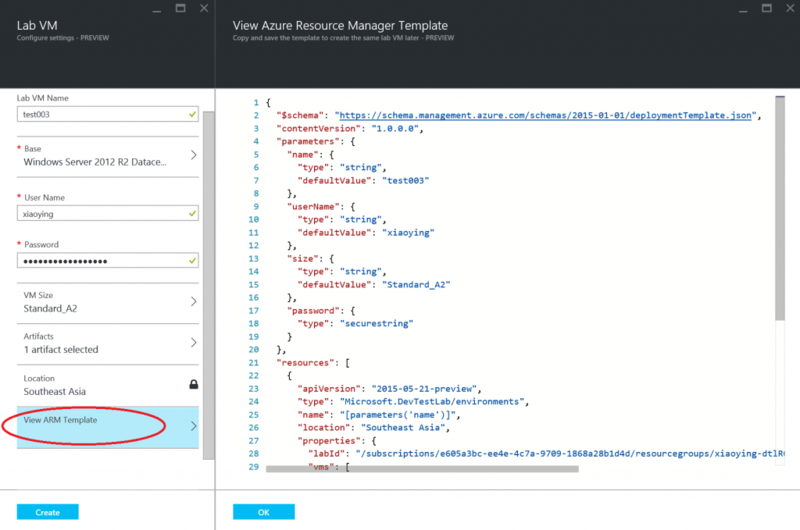 Create a lab by using an Azure Resource Manager template DevTest Labs is implemented in a way that allows you to create a lab by using Resource Manager templates. To make it easier to author the Resource Manager template, check out this quick-start template. Preview the Azure Resource Manager template when creating a lab VM The VM creation form in DevTest Labs now includes an option that allows you to preview the Resource Manager template used for a VM creation, based on the settings you specify in the form before the VM is created. 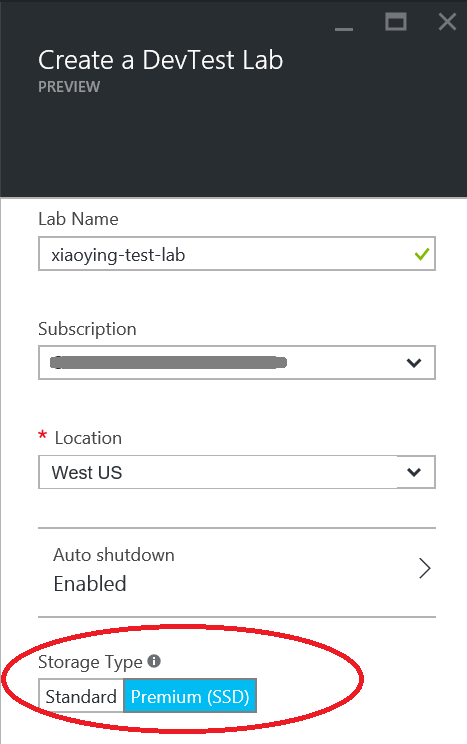 Create VMs in labs by using premium storage DevTest Labs allows you to create a VM by using premium storage so you can get the most powerful machine in Azure. To do this, DevTest Labs gives you an option to choose premium and standard storage when creating a lab. You can create VMs with premium storage if the lab has a premium storage account, and VMs with standard storage are created in a lab with a standard storage account. Try it today and let us know what you think about it! If you have an idea to make it work better for you, submit your feedback (or vote for others) at the Azure DevTest Labs Feedback Forum.